..:: The Tom and Jerry Online :: An Unofficial Site : ABOUT TOM AND JERRY ONLINE::..
On a cold winter's night in December of 1997, I had a vision. Maybe it was the cold...maybe it was the excessive amount of coffee I had consumed earlier, but it was a vision none the less. The vision: Design a Website. It started simple enough with a portfolio site, to showcase my artwork. I was too broke to send Art Galleries slides of my artwork so I decided the next best thing would be to make a web site. But I also wanted to do more...thus began the seeds of a Tom and Jerry fan site. Why Tom and Jerry? Because there was a need. I was an avid web surfer, still am, and I found little to no information about Tom and Jerry. So I saw the need. It started simple enough. January 1998 was the launch of the Tom and Jerry Dedication page. For 2 years the site steadily grew. More images, more sounds, more info, more traffic. In the Summer of 2000 when my friend, whose servers I was on, decided to get out of the web hosting business, I decided new changes needed to be made. 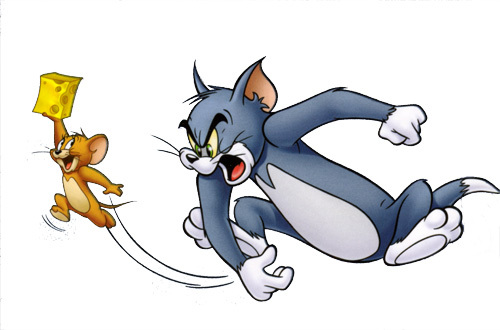 I dropped the saysomething.com address and dropped the Tom and Jerry Dedication Page moniker and took on Tom and Jerry Online. With a new name and new domain and new hosting and better web knowledge, this Tom and Jerry fan site grew by leaps and bonds! With a new design and new features I was content and the site remained the same with a few things added here and there from time to time. But that changed one Spring day in 2004, a new design was born, and thus came Version 5.0 of Tom and Jerry Online. A lot has happened to this site since it's inception, many wonderful things! And I have you, the Vistors of this site, to thank for that! Thank You! Thank You! Thank You! So here it is, Tom and Jerry Online...a Totally Unofficial Fan site.